More than 100 people gathered in the Ford Alumni Center’s Giustina Ballroom recently to celebrate the accomplishments and contributions of 10 Outstanding Employee Award winners. 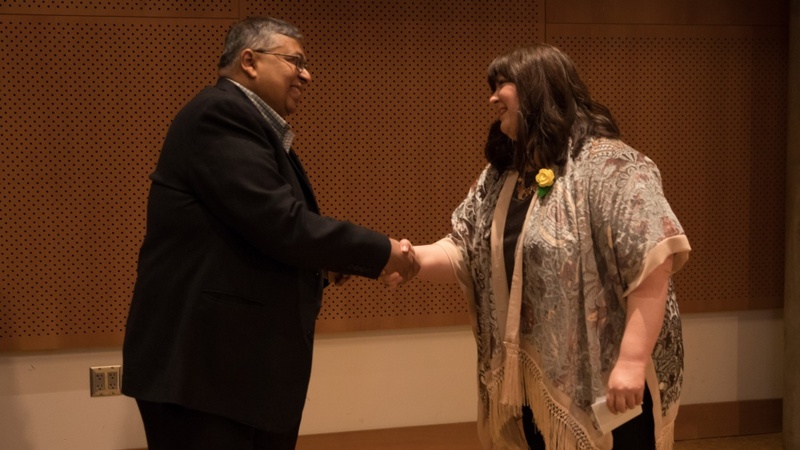 University of Oregon Provost and Senior Vice President Jayanth Banavar and acting co-Chief Human Resources Officer Kaia Rogers were on hand to congratulate this year’s recipients as each received individual acknowledgement and a custom-designed award to mark the achievement. The Outstanding Employee Awards recognize classified employees and officers of administration for excellence on the job. The honorees are nominated by their co-workers for outstanding achievement, such as for going above and beyond, showing exemplary leadership, building community and promoting the university’s mission. The Outstanding Employee Awards Selection Committee reviewed hundreds of statements submitted in support of employees across campuses. Doug Burzell, information technology consultant, UO Portland. Zach Fairchild, special events coordinator, Division of Student Life. Nancy Harvey, registered nurse, University Health Center. Jenny San, undergraduate program coordinator, School of Journalism and Communication. Jennifer Smith, administrative program assistant, Labor Education and Research Center. Amy Hughes Giard, director of first-year interest groups, Division of Undergraduate Studies. Abigail Leeder, director of experiential education and prevention initiatives, Office of the Dean of Students. Kristina Mollman, department manager, Department of Political Science. Betsy Tanenbaum, alumni network manager and recruiter, Knight Campus for Accelerating Scientific Impact. Stacey York, director of Master's Industrial Internship Program, Knight Campus Internship Program.